Meet the Artists: They Draw and Cook! During a family vacation three years ago, brother and sister duo, Nate Padavick and Salli Swindell, were sharing some time in the kitchen. Nate was slaving away over a hot stove, recreating a dish he had recently tried in Berlin, while Salli was drinking wine and drawing the beautiful crate of figs on the counter. "That's Nate's version of the story anyway," Salli jokes. "It was an aha! moment. I realized how much I loved drawing food, and so I illustrated the recipe that Nate was making, and posted it to my blog." Nate and Salli are the design team behind Studio SSS, specializing in artwork for greeting cards, illustrations for magazines and graphic design for arts organizations. 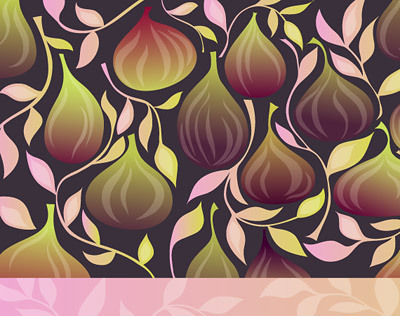 The recipe for Fettuccine + Figs in a Butter Balsamic Sauce was the first of many illustrated recipes to come. "We had the idea to collaborate with seven other artist friends and make a book of illustrated recipes to give to clients. One of the artists kept missing the deadlines, so in a moment of impatience and spontaneity, Nate posted the 8 recipes we had to a blog, and named it They Draw & Cook. It all happened within 15 minutes! Artists quickly discovered the site and started sending in submissions the very next day. There are now over 3,000 recipes on the site from artists around the world." With such a large response from artists everywhere, there were enough recipes to justify making a book under the title: They Draw and Cook: 107 Recipes Illustrated by Artists from Around the World. "The beauty of this book is that there are no perfectly presented photographs to compare with your version," explains Salli. "It takes the pressure off since you don't have a photo to gauge the outcome, and it puts the light heartedness and adventure back into cooking." When asked which recipe was their favorite? "That's like asking which child is your favorite - No fair! We like different recipes for different reasons and we've become friends with many of the artists so we love them all. Geninne D. Zlatkis is an amazing artist with a beautiful watercolor style, Kristin Nohe combines her fresh style with her Mom's Perfect Peach Cake and Martha Clark-Plank illustrates homemade play dough in her super hip graphic style. One recipe we have made and loved is Monkey Banana Cream by Daniela Garreton. It's so easy, yummy, and the illustration is so random and funny!" They Draw & Cook is still a very active website and blog, receiving more and more illustrated recipes every day. But the food related illustrations didn't stop there. The amazing duo also have their own personal projects. Nate published The Best Illustrated Cocktail Recipes, containing 24 great concoctions, ranging from classic martinis to special holiday drinks. The illustrations in this book are simple and so clever. 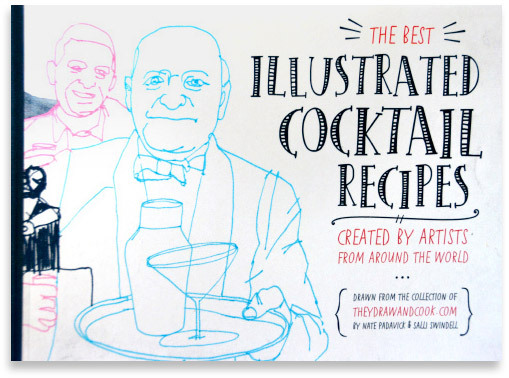 Each recipe is beautifully illustrated, making them as fun to look at as to make - and drink! The recipes are the very best cocktail recipes drawn from They Draw & Cook website. "Rebecca Bradley's Sidecar recipe is such a beautifully designed and illustrated recipe," says Salli. "When she submitted this recipe, Nate and I were in NYC at the time, and so we ordered one. Now it is my favorite cocktail! We would never have tried one otherwise." 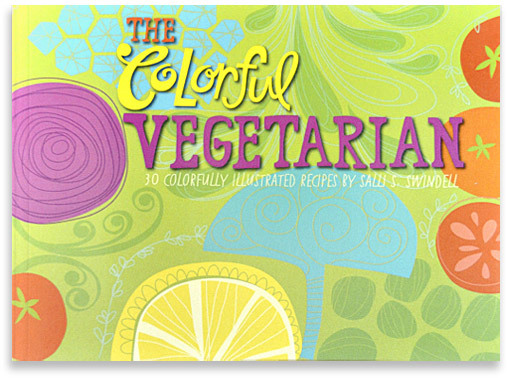 Salli, an avid vegetarian, has published a beautifully illustrated Vegetarian based cook book, The Colorful Vegetarian. "I've been a very vocal vegetarian for over 30 years. Probably obnoxious at times. I love making one dish meals that are colorful, easy and hearty. Nate is a HUGE fan of my cooking but my boys are not quite as enthusiastic." The Colorful Vegetarian contains 30 beautifully illustrated vegetarian recipes for everything from healthy salads, to delicious desserts. Each easy-to-make recipe is a vibrantly illustrated art piece that will both guide and inspire you. Hey, maybe I can cook after all?! A simple, fresh and fruity salad for a warm summer day. Discover the amazing artist and go behind the scenes of her first children's book, Dream Friends. Just perfect. I food, too & thought I was the only one. Nice to have company.